The cheese offer for the single person about town. Tired after a long day at work and can't face another microwaved healthy meal for one? Fear not - sit down to a delightful cheese platter of two cheeses, our dukkah infused Bakers' chips with a side of olives. The two cheeses we are offering this month are our Pepato and Thulimbah. Pepato is an Italian whole peppercorn hard cheese with a delightful spicy bite. Great with a glass of red wine when you are curled up in front of the fire! Thulimbah is a softer, creamy cheese that is astonishing in its velvety, buttery texture. Both of these pair beautifully with succulent Kalamata Olives from Mt Stirling Olives. 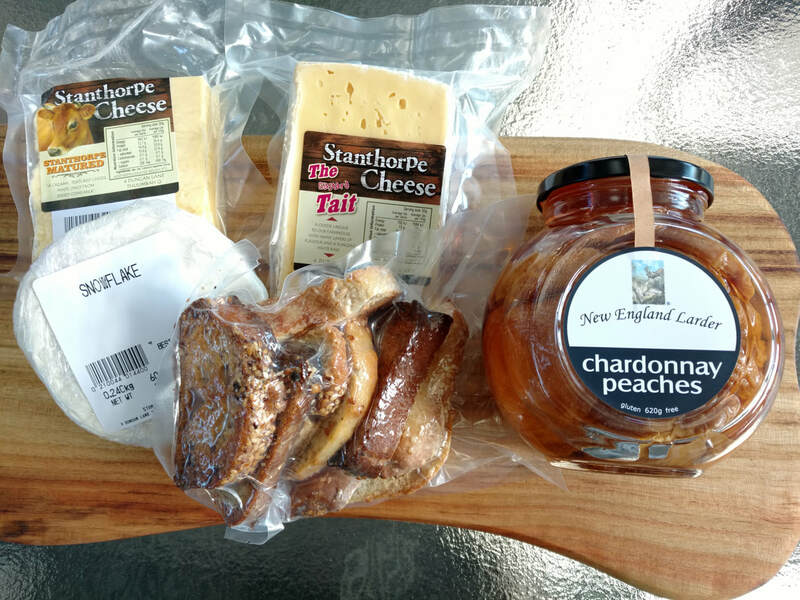 ​So in this offer you get 500g of cheese in total, a bag of crusty, dukkah infused Bakers' chips, and a 250g bag of Mt Stirling Kalamata Olives. Great value at $35.00! The cheese offer perfect for a couple - perhaps a platter for two on a romantic candlelit table? This offer gives you three cheeses, a bag of our dukkah infused Bakers' chips and a 620g bottle of New England Larder's Chardonnay Peaches for dessert. The cheeses included are 750g in total comprising a whole Snowflake (our extra creamy double-brie style), our delightfully nutty Tait (a harder white mould cheese, hand salted in the wheel with the eye development of a Swiss), and our unctuous cheddar style Stanthorpe Matured (robust and crumbly and ever so creamy). Just the thing for two at a bargain $50.00! Sometimes all you want is a cheese fest. Feed the masses or just gorge yourself! 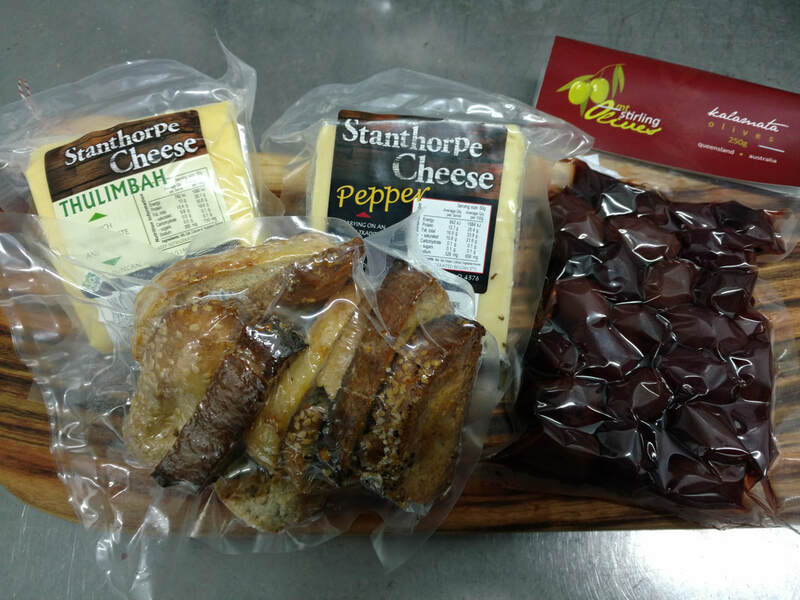 This offer gives you 1kg of four of our best cheeses, a 250 pack of Kalamata Olives from Mt Stirling Olives, two bags of our dukkah infused Bakers' chips and a 375g bottle of New England Larder's Red Capsicum Relish. 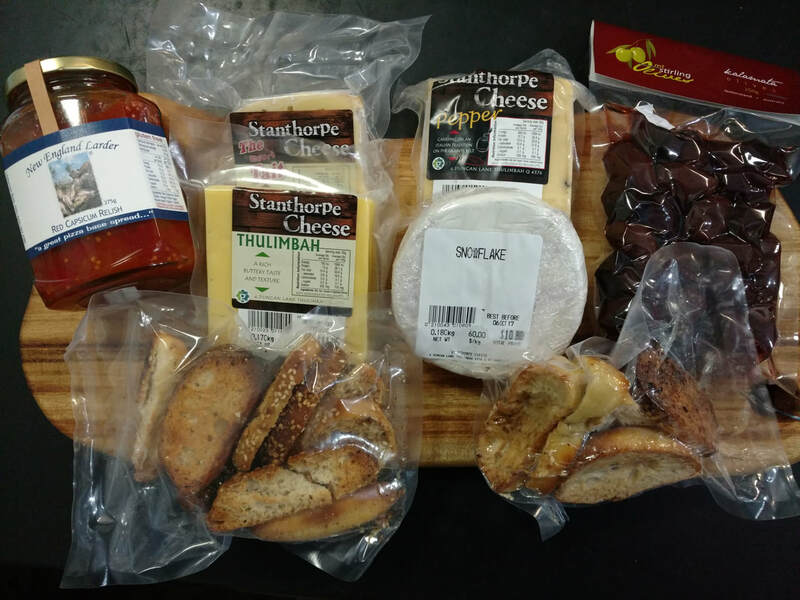 The cheeses included are Thulimbah (velvety and buttery), Tait (nutty and sweet), Pepato (whole peppercorn hard cheese with a delightful spicy bite) and a whole Snowflake (our extra creamy double-brie style). All this for only $70.00!